When Jerry Berner moved to Kendal at Oberlin, he quickly discovered the most popular physical activity at the community – walking the 1-mile perimeter. But Jerry, a member of the Cleveland Hiking Club, wanted to explore the many nearby parks, so he combined 2 of his favorite pastimes and formed a group for a weekly walk in the park. Walking isn’t the only low-impact exercise that can improve your quality of life. Try these! That was a dozen years ago, and Jerry and the group – size varies from 2 to 15 walkers – continue to hit the pavement or a trail every Saturday morning. Sometimes, the group heads downtown instead of a park, and the walks last at least an hour, often longer. “Walking is the best medicine for whatever ails you,” Jerry says. Along with the many physical and mental benefits of walking, the activity is easy to do and accessible to people of all ages, socioeconomic backgrounds and with a variety of limitations. And Oberlin, with flat terrain, sidewalks, a paved bike/walk trail, a vibrant downtown and the sprawling Oberlin College campus, is an ideal home for walkers. In fact, the city has a “walk score” of 75 out of 100, meaning it is Very Walkable, with most errands able to be accomplished on foot. “Walking improves circulation. 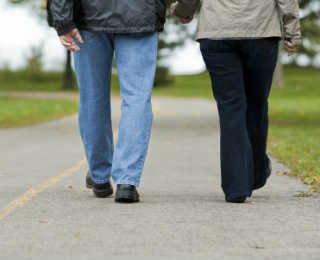 It also wards off heart disease, brings up the heart rate, lowers blood pressure and strengthens the heart,” says the Arthritis Foundation, listing a dozen benefits of walking. And walking can improve sleep. “A study from the Fred Hutchinson Cancer Research Center in Seattle found that women, ages 50 to 75, who took one-hour morning walks, were more likely to relieve insomnia than women who didn’t walk,” according to the Arthritis Foundation. “Researchers already know that any kind of physical activity blunts the risk of breast cancer. But an American Cancer Society study that zeroed in on walking found that women who walked seven or more hours a week had a 14 percent lower risk of breast cancer than those who walked three hours or fewer per week. And walking provided this protection even for the women with breast cancer risk factors, such as being overweight or using supplemental hormones,” the Harvard Medical School article explains. And an essay in The New Yorker examines the correlation between walking, thinking and writing, with quotes from Henry David Thoreau and other writers. The American Heart Association has put together “Walking, Take the First Step,” a comprehensive guide to help you get off to a safe start. Shoes and clothes. “Get your feet measured when you buy walking shoes. Just because you’ve been a size 7 all your life doesn’t mean that you’re still exactly a size 7. Feet can swell when exercising due to increased blood flow, so it’s not unusual to need a shoe that’s half a size larger than your street shoes.” Dress in layers, but don’t overdress – you should feel a little chilly when you head out. Begin with short duration and distance, gradually increasing and adding intervals of walking 1 block fast, 2 blocks slow. The end of your walk is an ideal time to stretch since your body is warmed up. Stretch your hamstrings and calves as well as your chest, shoulders and back. Hold each stretch for 15 to 30 seconds. Situated on 107 acres, the Kendal at Oberlin campus features ponds and woodlands, walking trails and numerous amenities, including a swimming pool, therapy pool, fitness center, and gardens. Our Fitness Center staff specializes in helping people customize a wellness program that fits their individual needs. To learn more about what Kendal at Oberlin offers, contact us for information or a tour.